Representatives of LGBT community disappointed after meeting with PM Netanyahu ends without pledge to raise pro-LGBT legislation. Prime Minister Binyamin Netanyahu hosted a group of representatives of the LGBT community at the Prime Minister's Residence on Sunday. 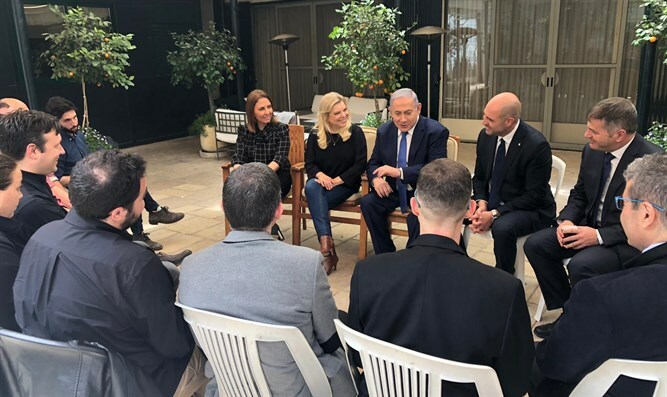 The meeting was also attended by the Prime Minister's wife, Sara Netanyahu, Minister of Social Equality Gila Gamliel, and Likud MKs Yoav Kish and Amir Ohana. Ohana is the first openly gay lawmaker to represent the Likud in the Knesset. During the meeting, the representatives asked Netanyahu to commit himself to promoting equality for LBGT citizens following the elections on Tuesday. The prime minister reportedly refused their request. "The prime minister refused to commit himself to promoting equality of rights as a condition for the establishment of the coalition and expressed concern about the opposition of the religious factions in any coalition that will be established. However, he declared that the education portfolio would remain in the hands of the Likud and not pass it on to the conservative parties," the representatives said in a statement following the meeting. "There is political and public importance to the very existence of a direct dialogue with the prime minister, and we hope that the positive and beautiful statements that we have heard today will be translated in the next term into legislation, that our right to equality will be upheld, and that there will be no empty promises as we have heard so far, said Ohad Hezki, the director of the LGBT Association in Israel.